Through regular collaboration with business and industry leaders, faculty and staff members at Piedmont Technical College are always tuned into the workforce needs of the region. As a result, the college readily creates programs to help fill these identified growth areas with skilled graduates. For instance, it seems every day there is a new report of computer hacking or system problems at a major company or organization. Local employers are facing similar issues. So, PTC is doing its part to prepare local workers to navigate an increasingly complex world of information technology challenges by offering two new certificates. The college has also added a certificate program for HVACR installers to help area residents beat the heat as summer wanes and stay warm as winter approaches. By creating certificates to address these employment needs, the college has created affordable, fast-paced pathways for students to get the credentials they need and get to work in a year or less. The Certified IT Professional certificate prepares students to take national certification exams offered by Microsoft, CompTIA and others. The Cybersecurity certificate prepares students to protect IT systems from attack. “We are seeing high demand for workers with these skills,” said Coronicca Oliver, instructor of computer technology at Piedmont Tech. The Certified IT Professional certificate is a 24-credit, two-semester program being offered on the Greenwood Campus. Courses range from computer systems management to operating systems to network architecture. Upon completing the program, students should be able to properly install, configure, upgrade, troubleshoot and repair computer hardware. They may then choose to take national certification exams. As of May 31, the S.C. Department of Employment and Workforce (SCDEW) reported 11 job openings in Greenwood County for computer systems analysts alone. Last fall, Computer Technology added a concentration in cybersecurity as part of the associate degree program. This fall, PTC is adding a one-year certificate program in cybersecurity. The 27-credit program is offered on the Greenwood campus. It includes some courses being offered for the first time by Piedmont Tech, such as computer forensics, digital forensics and certified ethical hacking. The certification is good training for someone who is interested in working as a security analyst. According to the Bureau of Labor Statistics, there were nearly 1,400 information security analysts working in South Carolina in 2016. They earned an average wage of $73,170 per year. SCDEW reported that as of May 31 of this year, there were more than two dozen open jobs for information security analysts statewide. Nationally, there were nearly 83,000 people working in the field in 2014, and the BLS expects that number to grow by 18 percent by 2024. HVACR stands for heating, ventilation, air conditioning and refrigeration. A new certificate program, which started this fall, will prepare students for an entry-level job in the field, according to Bill Cockrell, HVAC program coordinator at Piedmont Tech. Classes will take place in Piedmont Tech’s 10,000-square-foot, state-of-the-art HVAC training facility, which opened in 2016. “We have one of the nicest facilities around,” Cockrell said. Students will take 10 credit hours in the fall and 11 in the spring. 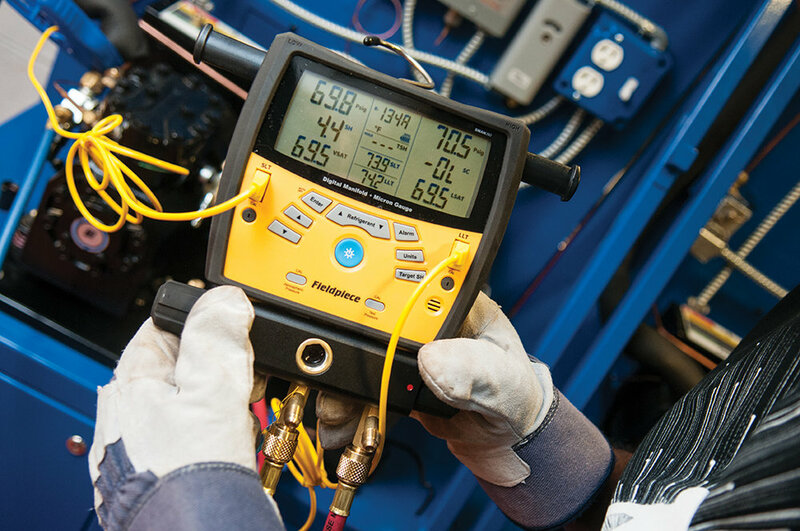 Coursework covers topics such as tools needed for the job and how to use them safely, as well as fundamental training in automatic controls, refrigeration, electrical, and sheet metal. The certificate holders will be a boon for local HVAC firms, according to Cockrell. There were more than 294,000 people working in that occupation as of May 2016. The field is expected to grow by nearly 40,000 workers between 2014-24, and that doesn’t count job openings created by retirement and attrition. There is more demand for air conditioning and refrigeration mechanics and installers in the Southeast than many other parts of the country. In fact, Myrtle Beach had one of the nation’s highest concentrations of HVAC jobs among metro areas, and the Pee Dee region was among the top non-metropolitan areas.